Falcon Heavy, the world’s most powerful rocket, launched this week from NASA’s Kennedy Space Center in Cape Canaveral, Florida. Space X, led by Elon Musk, live broadcasted the event to millions, both the launch of the rocket and then a live stream of the bizarre payload – a bright red car with an astronaut-suited driver, David Bowie’s Starman blaring from the speakers and The Hitchhiker’s Guide to the Galaxy references added into the mix. So what was the purpose of this stunt? Audacious showmanship, or scientific gamechanger? Well, it’s a bit of both. A couple of things make Falcon Heavy special. Firstly, it can carry about double the cargo of its nearest operational competitor. That’s 64 tonnes that can be blasted into space – roughly equivalent to 10 elephants. Instead of elephants, thankfully, they used a Tesla Car, one of Elon Musk’s other creations, along with a dummy driver called Starman at the wheel. They achieved this great lift partly because Falcon Heavy is actually three Falcon 9 rockets, stuck together. They blasted off into low earth orbit, and then the upper capsule, containing the payload, detached and fired into space. Then comes the unusual part, the rockets can be reused. 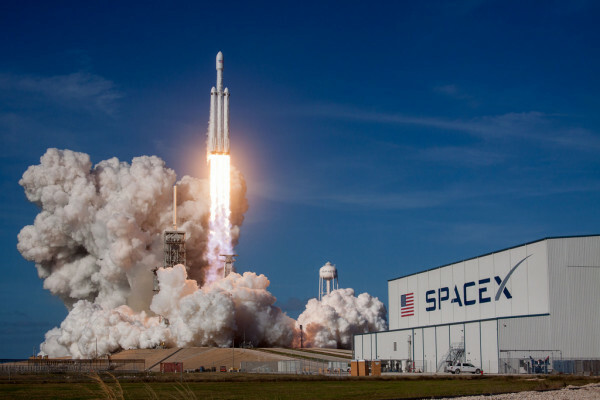 Most spaceships have the rockets crash land, and this means each new launch has to practically be built from scratch, but if Falcon Heavy can reuse the rockets this would cut the price significantly. Musk claims his method will reduce the cost of a launch by two thirds. But it didn’t go perfectly to plan. Two of the rockets made it back, with beautifully controlled synchronised descent, which wowed people around the world. Unfortunately, the middle rocket, which aimed to land on a separate platform in the sea, overshot and smashed into the ocean at nearly 500km an hour. And Starman and his car may be looking fabulous, but overshot their target of Mars, and are now headed to the asteroid belt, where it’s quite possible they will be smashed to smithereens. Despite these setbacks, people are lauding the event as starting off the new space race. It was a spectacle, and may inspire future generations to go into science, galvanise competition from businesses and further funding from governments. The technological developments mean we can send bigger things into space - such as satellites, telescopes or even robots on missions to Mars. But one of Space X’s biggest ideas is for the tourism industry. In fact, they want to take two tourists around the moon this year. This might lead to a brave new world, or worlds, of space tourism and planetary exploration. But there are concerns. Should the new space race really be in the hands of private companies? What are the carbon costs of repeated launches of this size, and could we be increasing the chance of littering space debris around this planet and others? Whatever your thoughts on the new launch you’ve got to admit, they certainly know how to put on a show. Previous Is there life on TRAPPIST-1? Should we all go 'electric'?